Put on your overall, take your spade and dig for diamonds on the reels of Diamond Mine. If you dig just deep enough, you might walk away with rare treasure hidden under the surface. Take over a mine and find your shiny diamonds! Diamond Mine Megaways is a 6-reel, 7-row and 117, 649 ways online slot. This game from Blueprint allows you to dig for virtual giant diamonds and bags of gold and win real cash! The megaway game is as a result of a partnership between Blueprint Gaming and BGT. If you are looking for a modern slot with a classic appeal, then this is an excellent choice for you. There are many things to enjoy about this game; from the graphics to the simple gameplay. Have fun with the cartoon design, set in wild-west America. The slot reels are built against the entrance of the cave, where the gold is. You can see the blue skies and a few clouds. The slot is in the middle of a desert, with hills, rocks and cactus. As expected, the background music is western, with a lively guitar melody to keep you cheerful. There is only one human character, and he is hilarious. The old fellow has a Santa-Claus-like white beard and a brown hat. He is a short and plump man with roguish eyebrows. However, he is always smiling because of all the gold he owns. He even has a gold tooth! The user interface is pretty simple. Use the scroll at the far right to regulate the size of your bets. At the bottom is a control panel, indicating the bankroll balance, the current bet and your wins. There are four high-value symbols; a huge diamond, a lamp, the bearded miner and a pair of shovels. Note that the diamond is the highest-paying symbol. Land between 2 – 6 diamond symbols and win up to 50 times your stake. The lower values are traditional card numbers; 9, 10, J, Q, K and A. The stick of dynamites ready to explode is the wild symbol and can substitute all other symbols. The reels are built in cascading form. So after a win, the successful symbols explode and the new ones drop in the reels. The reels will continue cascading as long as more winning combinations form. Once there is no winning combination, you can then bet and spin again. Watch out for the special TNT barrels. The latter can transform into matching symbols on the reels and create a winning combination. Win yourself free spins every time four scattered bags of gold land anywhere on the reels. For 4 bags, you receive 12 free spins. If you get another extra bag, you receive another 5 spins. During the Free Spins feature, bags of gold only appear at the top row. Land three or four bags there and win up to 10 extra free spins. Note that the Cascading Symbols feature applies here too. However, the multiplier for any wins during free spins increases by 1X for every cascade. 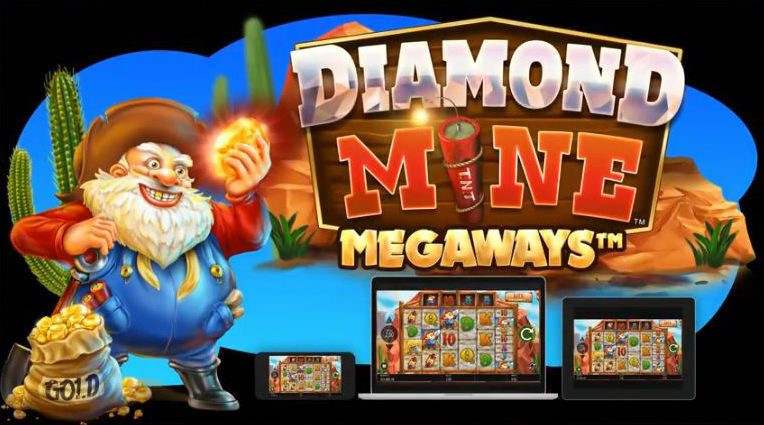 Diamond Mine Megaways is an online slot bringing some extra bounce to the mining genre. You might have heard that the slot is somewhat similar to Bonanza Megaways. Well –Yes, the gold-finder themes have similarities but Diamond Mine also comes with some unique features. Find this game in one of the major online casinos and play from between 20p and £100 per spin.